Sven Aarne Serrano, founder of Dragon Burn, shares his personal story of Burning Man’s origins. The origins of Burning Man are like theories on the Big Bang. There are conflicting accounts, with corrections hurled in by those who say they were there. This is my story.I lived in San Francisco for most of the 1980s, enjoying the cheap urban rent, punk rock clubs, and thick remnants of California counter-culture. I participated in performance art events and political demonstrations with several groups. Notably the Artists’ Television Access, and the Church of the SubGenius. While in Japan I heard about the early burns, so in 1996 I flew back to SF with my other wild Bay Area friends. They were ‘Rangers’ involved with setting up the event. After I returned I drove out to the Playa for my first ever Burning Man.This would turn out to be the last ‘lawless’ Burn before the breakup of the original leadership troika. It was still anything goes: tents everywhere, real firearms on the Playa, you could burn anything anytime and no cops. My friend and I got lost in the desert after mistaking the lights of Empire for Gerlach, but were rescued by a Ranger who guided us to safety. Unfortunately there was a price paid by a foolish Burner on a motorcycle who, while playing ‘chicken’ with his friends driving a truck, hit the mirror and died. Still, the band played on, the man was pulled up by everyone present with ropes, the early theme camps played music and supplied refreshments and people got naked. 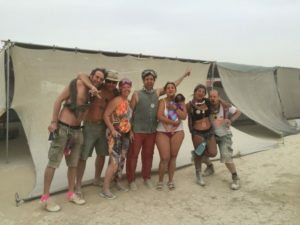 The next year the Revolution was institutionalized but the original energy was kept and stored safely like a genie in a bottle.Interested in going to Burning Man? Check out our handy guide or find out more on the official site!